Matt Romney has spent time with his father on the campaign trail along with the candidate’s four other sons. As Republican presidential hopeful Mitt Romney was heavily engaged in the end-game of his campaign against US incumbent President Barack Obama, Matt Romney, the second of Romney’s five sons arrived in Moscow last week before the presidential election scheduled to be held on Tuesday, to seek business opportunities-Russian investors, to be exact- for his California-based real estate company Excel Trust. The Republican presidential contender’s son is a senior vice president at Excel Trust that focuses on shopping centres largely in states from California to Florida and up to Pennsylvania. The company distributes 90 percent or more of its taxable income in the form of a dividend, in order to help investors avoid double taxation under the law. In his presidential campaign, Mitt Romney accused his rival Obama of not putting enough pressure on Russia over major international issues, including the ongoing Syrian conflict, Iran’s nuclear programme and the Kremlin’s crack down on the opposition in Russia. He also slammed Obama’s “reset” policy to improve US relations with Russia, accusing him of caving into Moscow’s pressure on the deployment of missile defence shield in the East Europe and conceding concessions during negotiations on the strategic nuclear arms treaty with Russia. Negotiations between Russia and the United States on the missile defence project have stalled over Washington's reluctance to give Moscow legally-binding guarantees that the shield will not be used against it. Washington and NATO say they need the nuclear missile shield to counter the threat of missile attacks from Iran. Russia says the project could pose a threat to its national security and has threatened a host of countermeasures. According to the New York Times, during his visit to Moscow, the junior Romney reportedly delivered a reassuring message to Putin that if elected president, his father wants a good relationship between the two countries. “But while in Moscow, (Matt) Romney told a Russian known to be able to deliver messages to Putin that despite the campaign rhetoric, his father wants good relations if he becomes president, according to a person informed about the conversation,” the paper said. On the face of it, it may look normal for Matt to send a reassuring message to Putin when the US presidential race was neck and neck, with Obama a slight favourite to win a second term, according to US state and national polls. In fact, Putin has been more diplomatic in his statements about Romney, saying he sees both an upside and downside to his sharply critical statements about Russia. “He (Romney) has once again confirmed the rectitude of our Russian approach to the issue of missile defence…He enhanced our negotiating positions on this sensitive and important issue,” Putin said at a press conference on September 11, adding he thought Romney's criticism of Russia was largely a campaign tactic. “I am grateful that he forms his position so freely,” Putin said, adding that he is ready to work with Romney in case the latter wins this year’s presidential election. Commenting on Matt Romney’s reported secret messages to Putin, the Washington Post said that assuming that Romney’s son was downplaying the rhetoric that Matt Romney was correct about how his father would govern, it would seem to portray the presidential candidate’s anti-Russian stance as more about campaign politics than about the foreign policy of a hypothetical Romney administration. “In other words, it suggests that Romney would follow a Russia policy a bit more like Obama’s,” it noted. According to the analysts, it seems less significant in pure foreign policy terms, if one takes into account whatever political embarrassment junior Romney might or might not have caused to his father’s campaign. 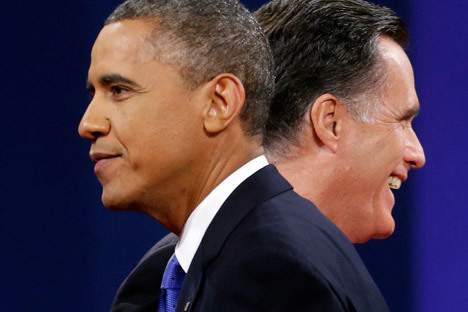 It may be recalled, after all, as many observers also pointed out following the third presidential debate, Romney spelt out a foreign policy, both in specifics and in worldview, not so different from President Obama’s. It is only natural for candidates to stress their “tough” diplomacy during a campaign but show more flexibility and cooperation once in office. Romney's opponents, Republicans and Democrats alike, immediately jumped on his remarks of tougher stance against Russia and used them as an opportunity to paint the candidate as out of touch on foreign policy issues. The US Secretary of State Hillary Clinton hit back against Romney's comments that Russia is America's “No. 1 geopolitical foe." “I think it's somewhat dated to be looking backwards instead of being realistic about where we agree, where we do not agree," Clinton said, labeling Romney's words as "dated," while there were more pressing matters of concern in global affairs. "If you take a look at the world today, we have a lot of problems that are not leftovers from the past, but are of the moment. In many of the areas where we are working to solve problems, Russia has been an ally." Clinton said. As Romney continued his tough talk against Russia during the campaign, blasting Obama’s “flexibility” to the Kremlin, Russian analysts called his remarks an election ploy that showcases his lack of foreign policy experience. “Everything he is saying now is, first of all, steeped in stereotypes, and secondly, follows the logic of the election campaign, in which he tries to address as sharply as possible everything Obama has done,” Fyodor Lukyanov, editor-in-chief of Russia in Global Affairs, said. While some experts agree that the Republican candidate’s Russia rhetoric is mostly heated election talk, they also see the truth behind the stereotypes that pitch the US against Russia as traditional rivals. “Let’s be realistic: Russia is the only nation in the world that can destroy the United States,” said Viktor Kremenyuk, deputy director of the Institute of the USA and Canada at the Russian Academy of Sciences. “Just for this simple fact, Russia is a foe,” Kremenyuk said, adding Romney was “looking for an enemy” against which he can consolidate hawkish Republican support. While Romney has said he would "reset the reset" in US-Russian ties, he has not said what exactly he would do differently beyond taking a tougher approach. Given US interests in a cooperative relationship with Russia, some analysts think Romney may have to tone down his rhetoric if wins the White House. "He may discover the value of Russia as a partner on some issues," says Andrew Kuchins, the head of the Russia programme at the Center for Strategic and International Studies. Meanwhile, Russian Foreign Minister Sergei Lavrov said last month that Moscow and Washington must do more to strengthen relations because the “reset” in ties cannot continue forever. “Instead of dwelling on the name of this or that stage, we should think about how to develop our relations. Or, again using computer specialists’ terminology, we should update the software,” Lavrov told leading Russian business daily newspaper Kommersant. Lavrov said that deepening economic cooperation would help improve ties between the former Cold War enemies but that some moves would have to wait until after the US presidential election.